A doctor of questionable sanity becomes infatuated with the wife of his least-liked patient. It’s a compliment to Welsh author Abse that even though he’s a retired doctor himself, you’d never know it. 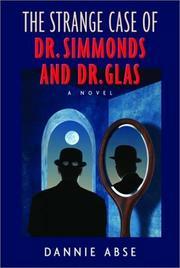 Here, his tale is made up of the journals of one Dr. Simmonds, a general practitioner in postwar London. Found by a present-day literary scout who is dubious of their literary value, the journals take us through some initially not-so-interesting developments in Simmonds’s everyday life. A bachelor, Simmonds lives in and runs his practice out of his childhood home. Although he apparently enjoys his solitude, there seems precious little else that he does like. His patients are by and large (to him) a complaining and unruly lot, and the large influx of European refugees, many Jewish, into the neighborhood and thus into his waiting room, has stirred up his severe anti-Semitism. One patient, especially, an Anton Bloomberg, seems to arouse his ire. Simmonds can’t stop commenting on Bloomberg’s noxious appearance and demeanor. Further inflaming the doctor is Bloomberg’s wife, Yvonne, whom Simmonds is convinced married Bloomberg simply for his money. The only counsel the physician receives is from his friend Rhys Morgan, who plays chess with him every Sunday, like clockwork. But Rhys’s comments only serve to stoke Simmonds’s imagination about what he sees as the unholy union between Bloomberg and “his gentle, Gentile wife.” The appearance of threatening letters that accuse Simmonds of being an evil man, and his compulsive reading of a novel (Dr. Glas, by Hjalmar Söderberg) about a doctor who conspires with a patient’s wife to kill the patient—these combined with Simmonds’s increasingly deluded writing style give hint to readers that they are in the company of a madman. Shrouded in the foggy malaise of postwar London: Abse works a fascinating riff on the Dr. Jekyll theme without adhering to it slavishly.